Charles Bobo Shaw in a photograph from 1976. 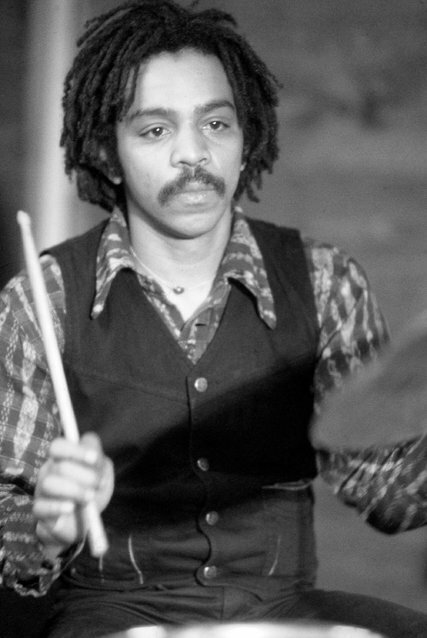 Charles Bobo Shaw, a jazz drummer from St. Louis who worked with major figures of the 1960s and ’70s jazz avant-garde, died on Jan. 16 in St. Louis. He was 69. His death, at a hospice, was confirmed by the trumpeter George R. Sams, a friend and frequent collaborator, who said that Mr. Shaw was hospitalized last month with multiple ailments. Mr. Shaw was equally adept at generating straightforward swing and funk or plunging into the coloristic flow of free jazz. As a founder of the Black Artists’ Group and the Human Artists Association in St. Louis, he was also an organizer in an era when forward-looking jazz musicians were creating their own infrastructure. Charles Wesley Shaw Jr., nicknamed Bobo by his mother, was born in Pope, Miss., on Sept. 5, 1947, and moved with his family to St. Louis as a child. He learned his fundamentals in the American Woodsman drum and bugle corps, which nurtured notable St. Louis musicians; he also studied with members of the St. Louis Symphony. Alongside the Black Artists’ Group, Mr. Shaw helped form the Human Artists Association, which allowed white collaborators, and an associated musical group, the Human Arts Ensemble, a name he continued to use for his own groups. He was a founder of a short-lived independent jazz label, Universal Justice, which vowed in a mission statement to bypass “the gangsters, mind molders and soul destroyers in the offices in New York,” according to Benjamin Looker’s book “‘Point From Which Creation Begins’: The Black Artists’ Group of St. Louis” (2004). The label released six albums, including one by the Human Arts Ensemble. In 1972, Mr. Shaw moved to Paris as part of a quartet led by Mr. Lake. Performing with fellow expatriates and working the European jazz festival circuit, the St. Louis musicians forged connections with better-known performers, spreading their reputation. Returning to the United States, Mr. Shaw settled in New York. In 1974, Ellen Stewart, the founder of La MaMa Experimental Theater Club in the East Village in Manhattan, gave him the use of her Children’s Workshop Theater, which became a hive of classes for children, jazz-group rehearsals, concerts and Sunday morning free-jazz church services. Mr. Shaw was also active in the 1970s on the downtown loft-jazz circuit, where experimentation was encouraged in spaces run by musicians. The Black Artists’ Group had found kindred spirits in the Association for the Advancement of Creative Musicians in Chicago, whose members were also migrating to New York City. These Midwestern musicians became a vital part of the city’s jazz vanguard. Mr. Shaw led a changing lineup of his Human Arts Ensemble during the 1970s and ’80s. He also performed and recorded with Mr. Lake, Cecil Taylor, Anthony Braxton, Steve Lacy, Lester Bowie, Frank Lowe, Billy Bang and others. His discography consists of some two dozen albums as leader and sideman. Mr. Shaw moved back to St. Louis in 1986 and continued to perform frequently there in various ensembles. He appeared in 2015 at the Vision Festival in New York City with Hamiet Bluiett’s Telepathic Orchestra. Mr. Shaw is survived by his sister, Marian Shaw Matthews; six daughters, Concere, Antasiah, Myah, Erica, Tracy Shaw and Loreene Sebbane; and a grandchild. An obituary on Monday about the drummer Charles Bobo Shaw, using information from his family, misspelled the given name and misstated the surname of one of his daughters. She is Loreene Sebbane, not Lorene Sabbane Shaw.